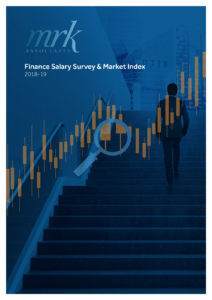 MRK Associates’ Salary Survey and Market Insight 2018/19 is now available for you to request your free copy. Covering finance and accountancy, and focusing on the Northern Home Counties, this is an essential guide for employers and job seekers alike. Loaded with leading-edge insight and unrivalled commentary, employers and industry observers will benefit from access to salaries and relevant employment analysis. Guidance is provided on the impact Brexit could have and giving you the very best tips on recruiting and retaining your workforce. If succession planning isn’t on your agenda, we explain why it should be! All business types are catered for with data for SMEs and corporates, so you can effectively recruit and retain with highly relevant and appropriate insight. In addition, accountancy practices have their section of data and informed commentary. This is a concise, yet comprehensive guide. For candidates and job seekers, our indispensable guide will fully inform you of what you should be earning, relevant to your job role. If 2019 is your year for a move, our insight will guide you and help position you to demand what you should be earning, by job role and location. Additionally, our helpful infographics instantly educate you on the growth of not only MRK Associates but also the industry specifically.